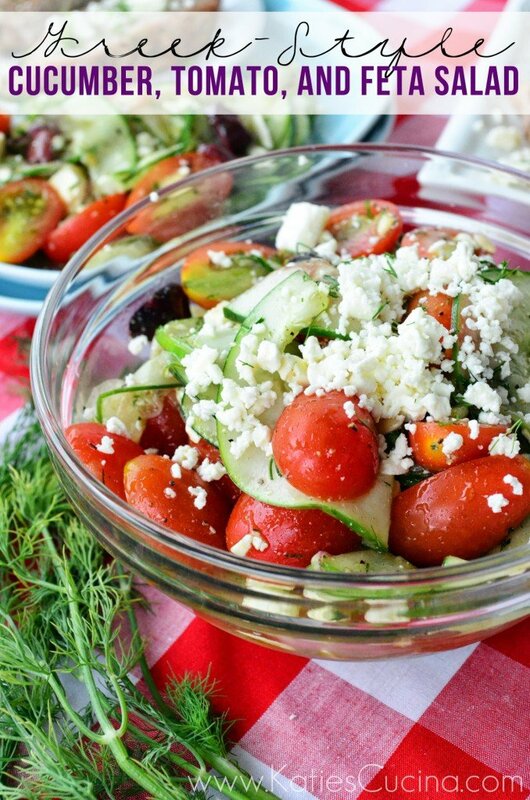 This Greek-style cucumber, tomato, and feta salad is one of my favorite salads. I make this salad at least once a week. Sometimes not as glamourous with the kalamata olives and the feta. Sometimes its a simple cucumber and tomato with the greek all-purpose seasoning, olive oil, and a little fresh dill from the garden. 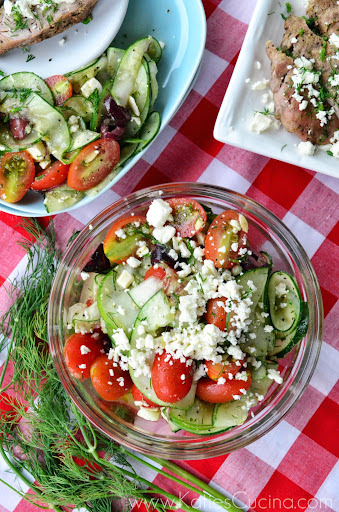 I first blogged about my Greek Cucumber & Tomato salad a few years ago. This was before I liked feta. Over the past few years, I’ve played with this recipe and its completely transformed into what I can now honestly call mine. I no longer use a processed salad dressing. I also thinly slice my cucumbers. I love using my OXO hand-held mandoline slicer. For those who know me–know that this is probably one of my favorite kitchen tools. The Greek seasoning I use has plenty of salt and flavor. Yesterday, I shared a Grilled Greek Pork Tenderloin that compliments this salad so very well. I received a few questions yesterday as to what Greek All-Purpose Seasoning I use. I use Cavender’s. It’s the only all-purpose Greek seasoning I’ve ever used. You can find this in the spice isle. I’m sure if you find other brands that will work as well. This Greek-style cucumber, tomato, and feta salad is best consumed fresh. I’ll make it just before dinner, pop it in the refrigerator to cool, and then top it with feta right before dinner is served. I like to let the Greek seasoning marinate on the salad for a good 30 mintues. The salt from the seasoning helps break down the cucumbers and the flavor absorbs into it beautifully. I love entertaining with this salad. I’ve never had anyone complain when they received this salad on their plate at dinner. Typically, the complaints I receive is that their is not enough to take home to enjoy the next day. This salad is good the next day, but not as great. The cucumber really start to breakdown and the flavors really marinate into the vegetables making them a little softer than I would prefer. I also don’t like the soggy feta cheese–but maybe its me! Everyone else who eats the salad the next day (when their are leftovers) loves it. In a large bowl combine grape tomatoes, thinly sliced cucumber, kalamata olives, red onion, and dill. In a small bowl whisk together Greek all-purpose seasoning and olive oil. Pour the dressing over top of the salad. Mix well, and let it rest in the refrigerator for 30 minutes. Before serving top the salad with crumbled feta. Store leftovers in a sealed container for up to 2 days. Disclaimer: There is an affiliate link in this post. No brands paid me to talk about their products, I just truly love the products and want to share with my readers. Loving this Greek kick that you’re on! Gimme a BIG bowl of this salad! This looks so good. I’m hoping to have some fresh tomatoes and cucumbers from my garden soon and this recipe will be perfect for using some of them. Thanks Paula. Regardless if you have them in your garden–make this salad asap! Perfect way to start off summer! What a beautiful salad! Perfect for the summer! I only use Cavender’s too, that stuff is awesome and I’ve probably used it for 20 years. Have you ever sprinkled it on cream cheese…yeah, it’s good. This is one of those happy summer salads with all the ingredients I love to eat! Thanks Cathy! Yes, I mix it on cream cheese and make my veggie bagel sandwiches! Christine–I agree! You can totally leave the feta out of his portion and just sprinkle feta on the individual bowls! This salad is beautiful. I love anything Greek and this salad is no different. Can’t get enough fresh dill! Ever! That’s so cool Steph! Great minds think alike! I love Greek salad! Will have to look for the seasoning next time I’m at Publix. You don’t expect from a Greek to tell you that she doesn’t like this salad do you? lol. I love it and eat it in several variations almost everyday especially summer that tomatoes and cucumbers are in season here! Thank Katerina! This is the perfect salad for summer!